Whereas last Saturday gave us cool early morning temps, this Saturday morning it is already 85 degrees and promises to climb into the 90s. So, the heat of summer has not entirely left us yet! Inspired by the heat and humidity, I have chosen a lighter tea today. It is an infusion of tea flowers instead of the leaf of the tea plant. For caffeine sensitive tea lovers like me, it can be a wonderful beverage choice for late afternoon and evening as it only has a hint of caffeine in its flowers. Most of the caffeine is concentrated in the new leaf growth of the plant. 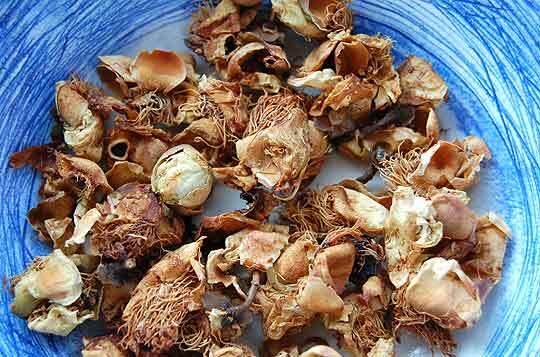 The flower petals are white on the plant but turn a golden yellow when they dry. 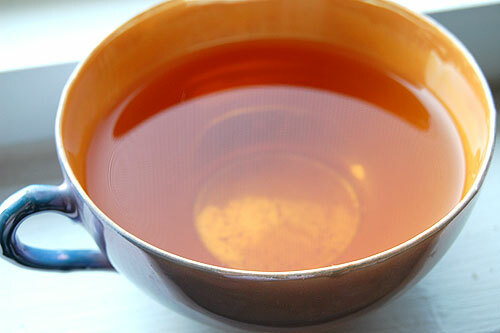 The tea liquor is amber colored and its taste is fairly robust for an herbal with hints of honey and nuts. I also like to make a blend of half tea flowers and half white tea. This not only decreases the caffeine level in the resulting cup but also results in an interesting blend of flavor notes as well, depending upon the white tea. Tea flowers are also very good as an iced tea. Ok, time to turn on the AC and ice the rest of my tea flower infusion! This entry was posted in Tea. I’m so glad that you mentioned the tea leaves. I’ve never tried them, but now I am very eager. If I blog about it, I’ll be sure to link to your blog and send you my post! Thanks Stephanie! I heartily recommend trying the tea flowers, if you get a chance, because they are a very different and pleasant experience.